At least four people were killed and seven were wounded in shootings across Chicago on Aug. 8, according to reports. 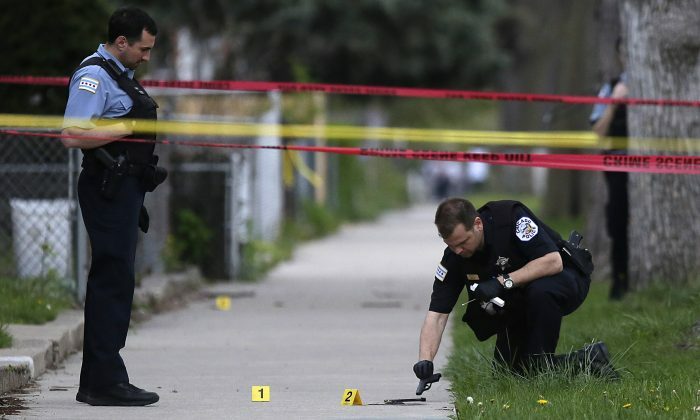 The Chicago Sun-Times, citing police, reported that someone fired shots into a moving vehicle with five people inside at 3:40 a.m. local time in the West Garfield Park neighborhood on the West Side. The shot-up vehicle crashed into a pillar, police said. Two people died and one person was injured in that incident, the report said. A 21-year-old man and a 22-year-old woman died after sustaining gunshot wounds, and they were taken to Mount Sinai Hospital where they were later pronounced dead. A 19-year-old man was shot and is in serious condition at Stroger Hospital. The other two people in the vehicle weren’t injured, police said. In another incident, at 12:43 a.m. in the Fuller Park neighborhood on the Far South Side area, a man was shot and killed. Someone walked up to a vehicle the man was sitting in and opened fire, killing him, according to the Cook County Medical Examiner’s Office. The shooter, who had a concealed carry permit, was arrested, police said. Over the weekend, 66 people were shot and 12 died in shootings across the city, CNN reported, citing police data. Chicago Police Superintendent Eddie Johnson said in a news conference on Aug. 6 that more needs to be done about repeat offenders. “As long as we fail to hold repeat gun offenders accountable for their actions we’re going to keep having these discussions on Monday mornings,” Johnson said, ABC7 Chicago reported.